This disc rather sums up the virtues and failings of this Melodiya series devoted to Furtwängler’s wartime recordings. The cache taken to Moscow after the war included performances it’s proved impossible to document with any remote degree of certainty. 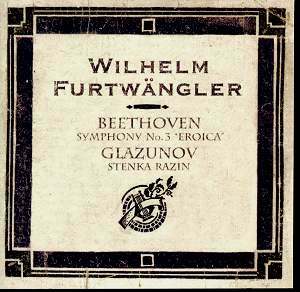 No one has yet shown that Furtwängler conducted Stenka Razin, though it is true that much earlier in his career he did conduct the Glazunov Violin Concerto. As I’ve written before, the generic notes address this issue in a half-baked sort of way and justify the inclusion of this and other material on insufficiently rigorous grounds. The DG sets devoted to the material didn’t include any such unverifiable material. The list of preserved Furtwängler Eroicas is a long one. There are at least nine of which I’m aware, ranging from this Vienna performance in 1944 to two Berlin performances in 1952. The only other orchestra with which he left behind an Eroica was the RAI. Still, this wartime performance is, in my experience, the most overwhelming and magnificent of them all. It’s a reading of the utmost gravity and eloquence and one of the conductor’s greatest explorations of a symphonic statement. The power here is trenchant but not overbearing. The sense of immediacy is coruscating and the directional pull of the music is pretty well unrivalled. Its logic and force emerge as if anew. And the Funeral March is here a supreme statement – intense but somehow still composed, still eloquently controlled. The marshalling of horns and trumpets brings an intensely nobility of expression. This is a performance that releases the intensity of the work in a way that his post-War performances didn’t quite manage. Later he evoked a more classical nobility which, whilst it proved preferable in Schubert’s Ninth, didn’t perhaps suit the Eroica so well. As for the Glazunov I’ve always understood this to be a misattributed recording made by Leo Borchard and the Berlin Philharmonic. There are certainly powerful reasons for some to have thought it by Furtwängler – the freedom and power, the flexibility and melodic elasticity, the sense of almost improvisatory drama is reminiscent of the older man and commandingly so. But this is Borchard. Given the foregoing choice will be determined by your desire, if you don’t already have one, for another Furtwängler Eroica. It is however the most dramatic and, insofar as these things are ever absolute, the most intense. With the Glazunov you get Borchard and a first class performance that’s also on an all-Borchard Tahra disc – but that’s not what it’s claimed to be on this Melodiya disc.